Ask Jeffrey Yoskowitz the co-owner of The Gefilteria, an artisanal Jewish food company, to show you his business card and you’ll see a title only a handful of people, if that, possess: Chief Pickler. Open his refrigerator in Brooklyn and the title makes sense. There are always jars of fermented goods. In late July, it was homemade cream cheese, a few varieties of sour cream, cultured butter, pickled beans, sauerkraut, and kombucha. Growing up in New Jersey, in a community of Holocaust survivors and their descendents, Jeffrey says Jewish food was mostly relegated to holidays — and trips to delis and dairy restaurants like Manhattan’s iconic Ratner’s. “Pickles were always in the house, but I’d be lying if I said I was a fan,” Jeffrey explains. At the delis, they would arrive gratis to accompany the meal. “[They] were an afterthought...there was something about not having to order it that never made me think that much about the pickle,” he adds. That changed after college when Jeffrey worked at Adamah, a farm at Isabella Freedman, a Jewish retreat center in the Berkshires. “I packed my car and came straight from graduation,” Jeffrey says. The summer before, the farm had a bumper crop of cucumbers that needed to be used up. “The story I had heard, was that one of the [members] had a recipe from their grandparents to make a classic Jewish sour pickle,” he recalls. The members made Adamah’s first batch of pickles that summer. By the following summer, when Jeffrey arrived at the farm, the team was building out The Picklearium. “I didn’t expect that I’d be into the pickling, he says. “I was really there to farm,” he says. But he developed a taste for the pickles as a snack after working in the fields, craving the salt following hours in the sun. He started working in The Picklearium regularly, making 55 gallon batches of classic sour pickles. “I just got so excited by eating them and the transformation process itself,” he says. The following year in Israel, during a research fellowship, Jeffrey learned he wasn’t the only pickler in his family. His great aunt Rukhl, who immigrated to Israel from Wyszków, an hour outside of Warsaw, where his father family is from, was a fellow pickler. She used the same method as Jeffrey: “It was exactly the same as I made,” he says. In 2014, he carried his pickling tradition back to Poland when he was invited to teach a class at the JCC in Krakow. “I found myself in a room with 30 people, none of whom were Jewish — all of whom had been making pickles since before I was alive,” he recalls. The group discussed one of the most contentious issues in pickling: the way best way to yield crunchy pickles. “I came back with all sorts of tips to pickle better,” he says. Today, when he teaches in New York or as far afield as Australia and Finland, his first priority is helping his students succeed in their first pickling endeavors, which is why he often starts with green beans (or dilly beans, as they’re called once pickled), which are easier to produce than those coveted crunchy cucumber pickles. 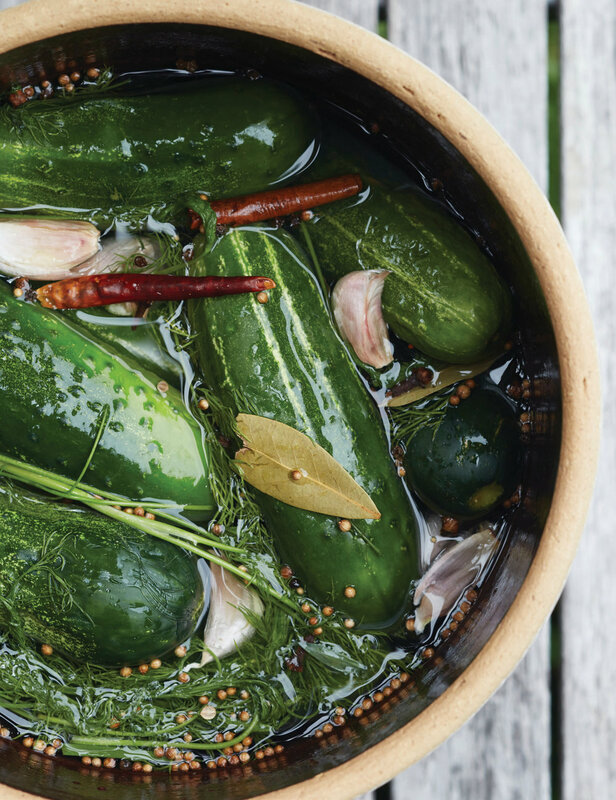 There is an excellent Fermentation 101 Guide that can be found on pages 44-48 of The Gefilte Manifesto for those who are interested in learning more or taking a deeper dive into the world of pickling. 1. Pour the filtered water into a clean widemouthed quart-size jar. Pour the salt into the water, cover with a tight fitting lid and shake to dissolve the salt. 2. Add the mustard seeds, peppercorns, bay leaf, dill, and garlic, then add the green beans. Pack the beans in tightly, squeezing as many as possible into the jar, making sure the brine covers the vegetables. If it doesn’t cover the beans, mix a heaping 1½ teaspoons of salt with 1 cup of water, then pour in enough to cover the vegetables. Seal the jar. 3. Let the beans sit at room temperature for 5 to 7 days, briefly opening the jar once every couple of days to “burp” it (releasing carbon dioxide). You’ll notice that the beans will turn pale after about 2 days. The time the beans take to ferment fully will vary depending on air temperature and elevation. Taste the beans each day after the fifth day until the desired level of sourness is reached. The brine will begin to appear cloudy and may be a bit fizzy. That’s fine. 4. When you are happy with the taste of the beans, remove all white yeast or mold from the top of your jar, if any has appeared. Cover the jar and place the pickled beans directly in the refrigerator. They will keep for up to 6 months. 1. If desired, fill a large bowl or bucket with ice and water and place the cucumbers in it. Let sit for 45 minutes or up to 5 hours. This helps firm the cucumbers so they retain crunch during the fermentation process, but it’s not absolutely necessary. 2. Fill a large ceramic crock or glass jar (gallon-size is ideal) halfway with the filtered water. Add the salt and stir until it has dissolved. 3. Add the remaining ingredients to the salted water, then add the cucumbers. Make sure the spices, herbs, and garlic are not simply floating on the surface. 4. Create a seal: If fermenting in a crock, use a plate or a wooden board to force the vegetables beneath the brine. If necessary, top with a clean glass growler or jar filled with water to ensure that the weight applies pressure on the vegetables, keeping them submerged. If fermenting in a jar, use a smaller jar filled with water to do the same (see page 45 for sealing instructions). Cover with a towel to keep out dust and bugs. 5. Let the soon-to-be-pickles sit at room temperature for 3 to 7 days. The longer they sit and ferment, the sourer they will become. At a stable room temperature, half sour pickles should take 2 to 3 days to ferment and full sour pickles should take 5 to 7 days (the amount of time may vary based on air temperature and even elevation). You’ll notice that the pickles will turn paler as they ferment. 6. Once the pickles reach the desired flavor, remove any white yeast or mold (or moldy pickles) from the top of the vessel and discard them. Yeasts and molds are a natural part of the process and typically occur only on the surface, where oxygen meets the vegetables. Don’t worry. Pack your pickles into smaller glass jars, then cover completely with brine and place directly in the refrigerator. They will keep in the refrigerator for up to 6 months. Note that this recipe calls for an extended wait time of up to 7 days. Also, pickling your cucumbers whole increases the likelihood of a crunchy pickle. Slice or spear your cucumbers only once they’re finished for best results. The brine will likely look cloudy and a bit fizzy. That’s 100 percent normal and healthy. 1. Wash the grapes well and remove them from the stems. Place in a clean quart-size jar. 2. In a small saucepan, combine the remaining ingredients to make a brine. Bring to a boil, stirring to dissolve the sugar. Reduce the heat to low and simmer for 3 minutes, stirring well. 3. Remove the brine from the heat and let cool until warm but not hot. 4. 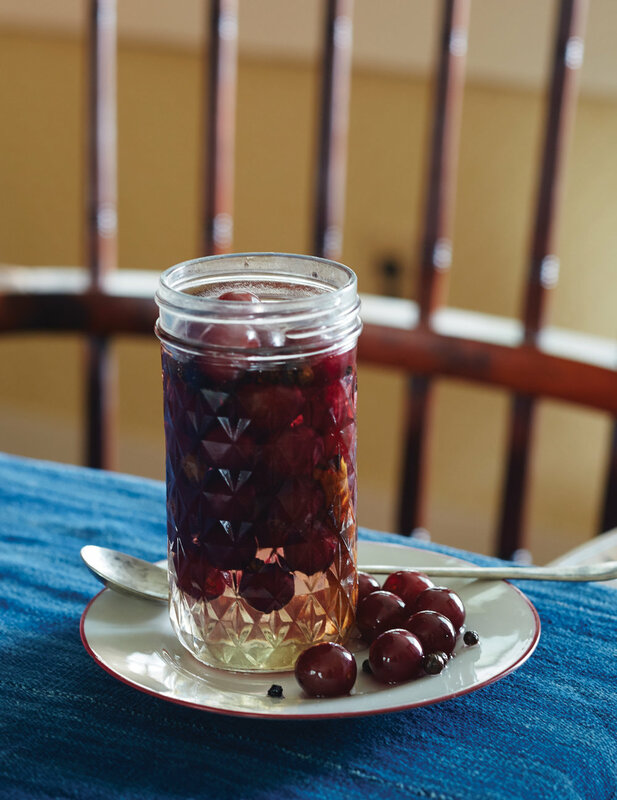 Pour the brine over the grapes and close the jar. Let cool to room temperature before refrigerating. Let sit for 24 hours in the refrigerator before serving. The grapes will stay delicious in the refrigerator for about 3 weeks.